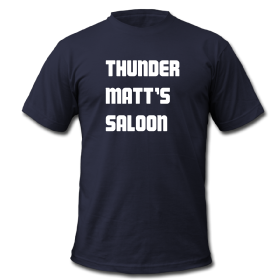 Thunder Matt's Saloon: TMS Shirts Final Closeout! 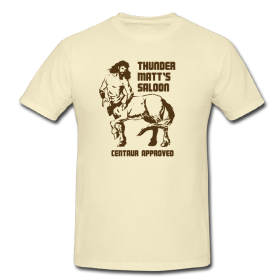 In the not-quite four year span of Thunder Matt's Saloon I've been pretty low key with plugging the Thunder Matt's T-Shirt Store, figuring folks were coming here to read our writing not to get an annoying sales pitch. Well, with less than two weeks left before we shut the lights off here and move to our new blog I'd figure this was a better time than any to finally give you an annoying sales pitch. With the TMS Era coming to a close, the shirts at the TMS Store will be officially retired as I begin work on creating new shirts for Exile on Clark Street. This is your last chance to buy a piece of TMS nostalgia. Here are the shirts you can still get your hands on. Centaur Approved and Purveyors of Esoterica - These are the two newest designs I created. Both of them are pretty sweet. I mean who doesn't want a shirt with a centaur on it? The only thing that is guaranteed to get you laid more is the long sleeved wolf shirt. 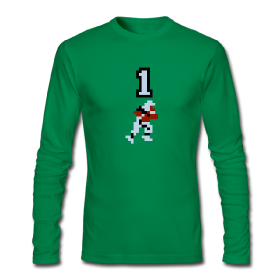 8-Bit Gridiron Glory and JO Sampson - Here's two shirts featuring our favorite running backs. One is the greatest video game athlete of all time, the other has served as a TMS guest correspondent over the years. Both look great on a shirt. DOUBLE LEGIT!!!! 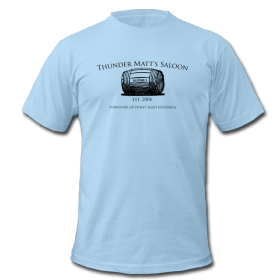 Thunder Matt's Saloon and Ast-Raped in '88 - The Thunder Matt's Saloon shirt took on various forms over the years to match our most current site design. This is the final edition. Ast-Raped in '88 is our best-selling shirt of all-time. I find that impressive and horrifying at the same time. Note: the Rick Astley post pre-dates the RickRoll internet meme. What About Beecake? and Tommy Buzanis - Sadly the comments to this post have been lost. What started with some cheap shots by Daft Funk at Billy Boyd turned into a barrage of angry comments and hate mail from his Fan Club. 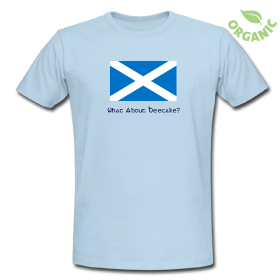 This shirt immortalizes one such angry fan's comment, referencing Boyd's band, Beecake back in Scotland. And thus "What About Beecake?" became the ultimate rhetorical question in TMS-lore. Speaking of TMS-lore, no character casts a bigger shadow than Mr. Tommy Buzanis. 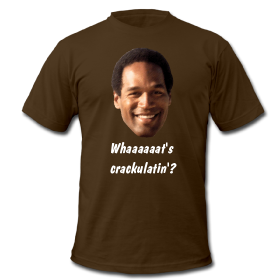 This shirt features an oft-uttered phrase from everyone's favorite steak-eating, fake-tanning, alcoholic divorcee. So hurry and order now. All profits will help me buy a bootleg copy of "New Moon" on DVD. I'm gonna buy one of those shirts so I can wear it. You need to keep JO Sampson in one way or another. His "Low Down Dirty Shame" articles are, by far, some of the best. Legit!! !